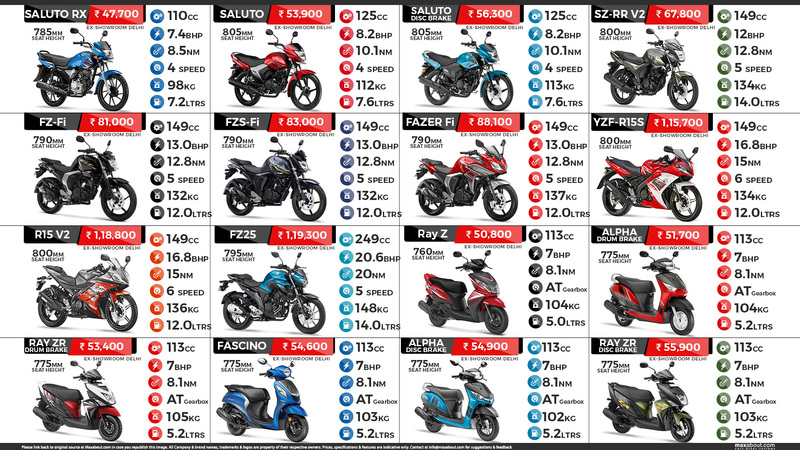 Yamaha India was the first brand to display the revised prices on their official website in such a way that users can see the price difference in their respective states with just two clicks. They helped many understand the concept of GST as those bikes which saw INR 1000 going from ex-Delhi price had a reduction of around INR 5,000 in Madhya Pradesh. The uniformity in prices was well applauded by the fans as Yamaha was the only brand to bring down the price of FZ25 to a lower point than it was launched in the country. They were even the best ones when it came to passing of GST benefits properly. Yamaha currently has an extensive lineup of products, starting from 110cc and moving to 250cc in the locally manufactured segment. The list includes six scooters, including their drum and disc brake variants. Yamaha Saluto RX is the most affordable product at INR 47,700 while Yamaha FZ25 is the flagship here with INR 1,19,300 of price tag. It is even the most powerful option with 20.6 BHP and 20 Nm of torque. It weighs just 148 kg and comes out as the only Yamaha bike to sprint from 0-100 kmph under 10 seconds. Apart from them, Yamaha R15 and FZ are two most popular sport bikes series of India.